Despite so much personal loss in the national tragedy that was The Station Fire, Gina Russo offers readers an emotional story of hope and triumph that will amaze and inspire. On February 20, 2003, nearly 500 people filled a small rock club in West Warwick, RI. During the performance, a pyrotechnic display ignited a fire that quickly engulfed the interior. The incident became the fourth deadliest fire in U.S. history, killing 100 and injuring hundreds more. Gina Russo was one of the survivors. She woke from a long coma to learn of the devastation that claimed her fiancée. She would endure months of physical therapy and carry psychological scars that would test her spirit. This is the story of how one woman found strength and hope rise From the Ashes. 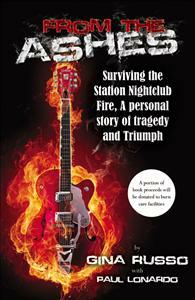 i had read the insert of this book, i thought it was an accurate detail of that fatal night. Ms.Russo and Mr. Lonardo did a great job in telling the story of the night club. I like to wish them all the best and good luck.